Parents of a six year old boy on the Isle of Wight say they will legally challenge an Isle of Wight Church of England school for allowing boys to wear dresses to school. “There are boys and there are girls” said the father, Nigel Rowe. An Isle of Wight couple made the front page of the Sunday Times yesterday, as they threaten to legally challenge an Isle of Wight school Church of England primary school for allowing a six year old boy to wear a dress to school. Nigel and Sally Rowe made most of the national newspapers and also appeared on BBCR4’s Today programme this morning (Monday), speaking about their concerns. They told the BBC presenter their concerns were raised when their son came home from school saying “I’m confused, I don’t know what’s going on,” after a boy was allowed to wear a dress to school. The presenter asked whether there was anything other than the clothes that worried them or their son. 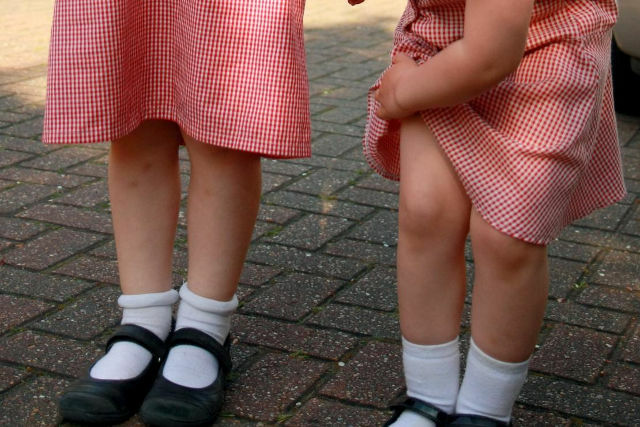 The parents agreed they would not be concerned if girls wore trousers to school. He went on to explain he and his wife wrote a letter setting out their points. Better judge than child’s parents? The presenter went on to explain the growing evidence of a rise in self harm and suicide of transgender children and adults because they are not accepted. “Church of England schools are inclusive environments where pupils learn to respect diversity of all kinds. Like any other state school, our schools comply with the legal requirements of the Equalities Act 2010. Among other things, this requires schools to accept the wishes of children and their families with regard to gender identity. It would be unlawful for any of our schools to do otherwise. The Isle of Wight council have said they would not be commenting on the matter as this is a diocese run school. 9.50am Comment from Diocese added. 38 Comments on "Isle of Wight parents to sue over boy wearing dress to school"
Well, there we will have to differ as I see nothing in that report to indicate that they are anything other than swivel-eyed fundamentalist zealots. Sadly this isn’t about the right to wear what one wants; it’s about children under threat of ‘sanction’ (punishment) for using what for millenia has been the right word but has now been deemed wrong. Amazes me when people use their “It’s my beliefs” card. These people don’t follow the bible word for word they just use whichever convenient verse they can to justify their own bigotry and prejudice. Hasn’t the Bishop already set a precedent with his work apparel? This is about a child, with gender issues, shame on you. Intolerance is very unbecoming. You should swot up on your manners and try not refer to a child as ‘it’! The toliet issue is easily resolved. Get rid of the stupidly unhygienic bullying headquarters that are separate cubicles in rooms labelled for boys or girls. Replace them with lots of individual inclusive rooms, each with its own door, toilet and washbasin. I find it hard to think of anything charitable to say about the Rowe’s attitude. If the child is confused about their gender identity then I imagine that the fuss they are making about this is never going to help matters or the child. It would be better for all if they simply kept their views to themselves. I wonder if this 6year old actually has gender issues. I think it more likely that the parents are taking the micky at the boy’s expense when others at the school ridicule him. On what grounds do you make that assertion? What are your qualifications to make this assertion? What is your knowledge of this situation that gives you the insight to make this assertion? Congratulations to this school and the parents of the boy who chooses his uniform. As an eleven year old newly elected to the school council I remember the campaigning to allow girls to wear trousers and now it is commonplace, even mandatory. Wear your school uniform with pride! pretty ridiculous for the Christian parents to become so alarmed IMHO – chill out! susie green from mermaids on (Tuesday) radio 4’s `today` – 2 hours and 50 minutes approx. into programme. Read that Premier News link at your peril. Such a lot of vicious, nasty, people pretending to be “Christians”. Some of the comments actually made my skin crawl. That wasn’t an “angry” insult, deary, that was an honest appraisal of your mindset. I could now add “confused” to “swivel-eyed rant” after the above pile of gibberish. I note that rather than dealing with what I have said you have taken the usual resort of limp liberals when faced with scientific truth by ignoring it. Why that’s all? girls wear trouser so the kid (boy) can still wear trousers and think hes a girl (which he ain’t) This world and the liberal elite wont be happy till we’re all mixed race and unsexed and unnatural people. What say you about the punishment threatened by the school authorities to six year olds who use what they deem (through Orwellian newspeak)the ‘wrong’ words? That would rather depend on what the ‘wrong words’ were, which is not a point raised in the article, but may have been in subsequent posts; I haven’t read through all of them. Supply a bit of chapter and verse, or point me to the post, and I shall endeavour to respond. Oops, didn’t spot the stupid autocorrects that turned ‘sorts’ into ‘sports’, or ‘own’ into ‘one’.